Evangelize Cincinnati. We share Christ. You participate. Evangelize Cincinnati equips you to share your faith biblically. You can engage in one-to-one evangelism. Christ’s name will be exalted. Your confidence will grow as you participate in biblical evangelism. You will share your faith more often. 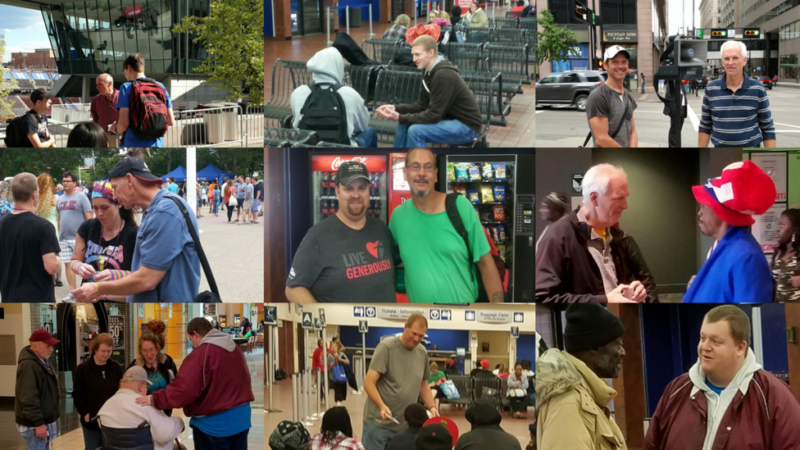 You can join regularly scheduled biblical evangelism outreaches. God may choose to use you as He works in someone’s life to grant them the gift of repentance and the knowledge of the truth. Put your skills into practice with evangelism outreaches. Learn some new tricks or techniques. Network with other local biblical evangelists. Learn how to share your faith biblically. Grow through participation in regularly scheduled evangelism outreaches. My name is Dave Doerman. I have a passion for sharing Christ. I strive to equip others in evangelism and give glory to God. This lay ministry is self-funded. Why do we do this? Love for God. Love for people. People are dying today without knowing the truth about God. Most people think they are going to heaven because they are a “good person.” And people think there are many roads to heaven. But according to Jesus of Nazareth, all of us are destined for an eternity in hell unless we trust in Him alone for salvation. In gratitude, we then strive to transform our lives by following Him. We share the truth of Christ’s gospel and give God the glory. You can share the law and gospel with friends and strangers. You may be used by God to make a difference in someone’s life and eternal destiny. Please pray that God would work in us to will and to work for his good pleasure. Sign up now to receive free evangelism resources and updates!